A major thoroughfare in Torrington, as viewed to the south in GTA III. Torrington is a commercial district in southeast Staunton Island, Liberty City in Grand Theft Auto III, Grand Theft Auto Advance and Grand Theft Auto: Liberty City Stories. It borders Newport to the north, Bedford Point to the west, and an unspecified body of water to the south and east. 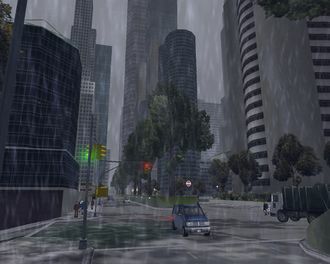 Torrington is based on Financial District, Manhattan, and this is where are located most of the buildings in Liberty City. Torrington serves primarily as a financial district in Staunton, its primary features being its massive office towers and strong corporate presence, contrasting the Bedford Point, which also fulfills as a similar role as a commercial hub, but in a less formal manner. Torrington's skyline, as viewed to the west from Callahan Point, Portland, GTA III. Torrington boasts few places of interest aside its towering skyscrapers and a casino on the southeast, which assumes different names in GTA III and GTA Liberty City Stories, Kenji's Casino and The Big Shot Casino, respectively. Among Torrington's skyscrapers, the tallest building in the entire city in GTA III, which the official website of GTA III claims is occupied by the "Jefferson St. Credit Union" and situated in southwest Torrington. Likewise, AmCo's headquarters appears to be based in the district, as are FBC Bank, FBI offices and the LCPD's head office (including that of the SWAT branch). A building mimicking Trump Tower in New York City is also located on the southwestern corner of Torrington. In GTA Liberty City Stories, the Jefferson St. Credit Union building is only half its height as it is still undergoing construction. Donald Love uses the building as his temporary head office and residence (as opposed to the Bedford Point-based Love Media Building in GTA III), before his defeat in city elections and subsequent bankruptcy after "Love on the Rocks". In both GTA III and GTA Liberty City Stories, Torrington is controlled entirely by the Yakuza. In GTA III, Kenji's Casino serves as the location where the player may receive missions from Kenji Kasen, the co-leader of the Yakuza circa 2001. In GTA Liberty City Stories, set three years earlier, the player may receive missions from Toshiko Kasen, the disgruntled wife of the then head of the Yakuza, Kazuki Kasen, from a high-rise apartment near The Big Shot Casino in Torrington. This page was last modified on 23 September 2011, at 00:07.